Hank Aaron saw his name bypass Babe Ruth's on this April 8, 1974 swing of the bat. Springtime is here and the weather is warming. My thoughts are returning to spending time on the beach and baseball, two of my fondest memories of childhood. The beach is fun for almost everyone so it is easy to understand my thinking there, but baseball, how can baseball be such a fond memory? Let me tell you. Baseball just may be the perfect sport for a young man to learn; if there can be such a thing as the perfect sport. It is full of life’s lessons. If learned, the lessons will serve you well no matter what you undertake. On the one hand it demands teamwork, on the other it allows you to perform as an individual. At times you will share the joy of another’s achievements, other times the spotlight will be on you. And yes, forgiving someone’s poor performance is required, just as you will ask your poor performance to be forgiven. It is true that other sports allow the same things to a point, but it is in baseball they are best displayed. What makes baseball different is standing at the plate. When you do, it is one against nine. Some might point out basketball has the free-throw line, and soccer has the penalty-kick. They are certainly times for individual achievement, but it not the same thing. In baseball every player takes turns at the plate at least three times in a game. OK, American League fans, I know the pitcher does not normally bat but that is the exception and a debate for another day. Growing up, I played little league but was never the greatest of players. Still, it was fun and that along with watching the Atlanta Braves play forms my memories. Now, if you know anything about baseball and my age, you know that means I was a Braves fan during the “rotten” years. Yet, watching them as a kid was pure joy for me. It is hard to relate just how bad the Braves were back then. Back then, Atlanta-Fulton County Stadium held about 55,000 people. The most I ever saw when I went to a game was maybe 5,000. Regardless, there was something magical about it. Simply being in the park was something special. Every kid could feel the magic and every adult was a kid again. Win or lose, it did not matter to me – I was there. I could smell the grass, I could eat the hot dogs, I could feel the sun, and I taste the clay dust in the air. Besides, the Braves had their secret weapon to keep me watching, Hammerin’ Hank! 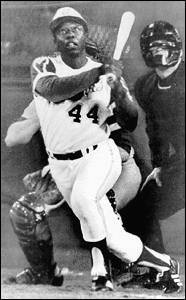 Watching Hank Aaron play baseball was delight personified for me and taught me lessons that went way beyond the game. Each time Hank came to bat I’d hold my breath. On a side note, those of us that are Braves fans call him Hank in admiration. I promise you when I met him, face to face, it was all “Mr. Aaron.” I had the pleasure of meeting him one time in Atlanta when I was in my 30s. I had met a good number of famous people by then and was largely unimpressed, but when I met him I was giddy like a teenaged school girl meeting a pop-start. It was just one of those publicity things the he must have done 10,000 times but he was kind and suffered idiots, like me, with grace. I hope every kid gets to meet one of their personal heroes, even meting them years later as an adult is a remarkable feeling. I remember the excitement in 1974 when Hank broke Babe Ruth’s home run record. Times were very different back then. The idea of a black man breaking Ruth’s record did not sit well with some. They even sent death threats and all sorts of stupid stuff like that. All I knew was Hank broke the record and I was proud. I was a white boy from South Georgia, proud of a black baseball player in Atlanta that broke a record. In my eyes, he stood for something. He stood for devoting yourself to a task, doing it well and being the best at it. When you are a kid, you do not care what color your hero is, he simply is your hero. He was my hero then, truth is, he still is my hero today. Another point that I did not even consider until years later, he did it all without the drama sports stars of today seem to fill their lives with. Now days, a kid picks a hero only to see them disgraced by their own actions. It is sad really. But back to my breath holding and Hank at the plate, this is where baseball has a little something different than other sports. There Hank was, at some major league park while I was Mallory Park Little League field on St. Simons Island. We stood, inches from the plate, he at his and me at mine. A pitcher 60.5’ away was about to throw a hard, little rocket right by our faces and it was up to us hit it with a bat. This was our chance to shine. You get to hit the game winning home run or a World Series grand-slam, at least in my mind that is how I dreamed it. For Hank and the other professional baseball players, they really live it. As nice as that is, it does a player little good to be in it only for the glory of standing at the plate. Hank proved you can break all sorts of hitting records and still be on a losing team. It takes teamwork to win games. Without question Hank Aaron was hired for his batting. Still, he brought more to the game than that. As an outfielder, Hank won three consecutive Golden Glove awards. The Golden Glove is awarded yearly to the players that exhibit the best defensive play, the time when the player is part of the defensive team effort. This is what Hank proved to me: good batting earns runs, good fielding earns wins. us lives in a vacuum. Our individual achievements mean nothing without the teamwork that makes them count. What could Gates be without Allen? What would Jobs be without Wozniak and Wayne? What would Edison be without Tesla? What would the Babe be without “Murderer’s Row?” Yea, what would Hank be without the Braves? There are times in life when you are part of a team, other times you stand at the plate alone. Sometimes you will get the hit (succeed), sometimes you won’t. The point is to try, to simplyput yourself out there and try. The only guarantee is you won’t hit the ball if you don’t stand at the plate. Even a great man like Hank Aaron struck out over 1,300 times. All great people know this experience; Edison had hundreds of successful ideas. How many unsuccessful ones did he have that we know nothing about? 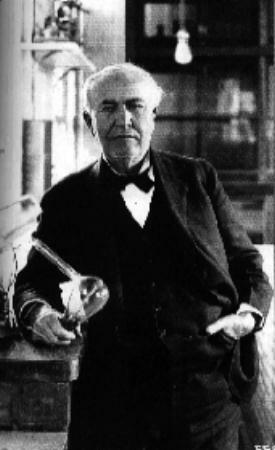 Edison’s failures came in private or were known by but a few, they were personal and still he went on. Aarons’ strikeouts were on a much larger platform and very public, he too went on. The true disappointment is not striking out, or failure if you will; it is not having the guts to stand at the plate. Edison knew this, Aaron still does. Congratulations to the University of Alabama’s football team for winning the National Championship game last night. Had Colt McCoy been able to stay in the game for Texas, it might have made the difference for them. His loss sure changed the dynamic of the game. Still, the Crimson Tide won which made Nick Saban happy to say the least. I think Alabama’s turnaround under Saban’s guidance in truly remarkable. Growing up in the 60s and 70s, I remember Alabama under Bear Bryant always being a powerhouse. It is good to see them regain some of that swagger; it means the world is again spinning in greased groves. Don’t get me wrong, I am a UGA fan till the bitter end, I just am glad to have Alabama return to its proper place as one tough opponent. As much as I like college football, it does have its problems. It is more business now than sport. Major university programs generate over $100 million a year in revenue. No wonder Coach Saban made almost $4 million in compensation this year. To be fair, he is not alone in receiving an ultra-high salary, about fifty colleges and universities pay their head coaches over $1 million a year. While I see the value sports adds to school, I don’t think a coach should make so much while tuition continues to rise. According to the University’s website, the total cost (tuition, fees, boarding, books, transportation, and miscellaneous charges) per year for an in-state student is about $22,000 a year, while an out-of-state student pays about $35,000. Look at it this way, what they pay the football coach equals the cost to educate 181 in-state or 114 out-of-state students. Does this level of compensation follow the schools core mission, to educate? Colleges and universities engage in something akin to the nuclear arm race of the Cold War, each trying to out-spend the other by building ever more expensive sports complexes to attract coaches and players. The net effect is a huge upward spiral in money the programs cost with little improvement in graduation rates. The NCAA is quick to point out the rate has improved to around 79% overall, the key word being overall. That rate does not hold in the marquee sports that generate all the revenue. For instance, the Alabama football team touts a graduation rate of only 55% in recent years. If the goal of attending college is to graduate with a degree, college football gets a failing grade. Maybe it’s time to adjust a coach’s pay to the graduation rate of their players. Sorry Nick, that means you have to give back $1,800,000 this year.